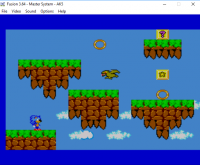 View topic - [Hacks competition 2019] Sonic in Miracle World by law81 - Forums - SMS Power! 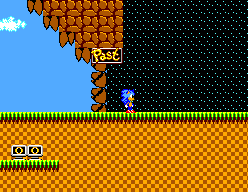 Dr. Robotnik has found a different way to try to defeat Sonic teleporting him to the Past. 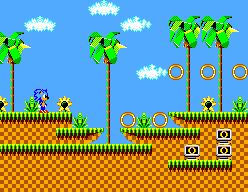 But the Past is another world, the "Miracle World" where its creatures will try to stop Sonic for ever. he will test his new skills. While lacking in polish in some areas, such as the title screen and glitching enemies, the two levels are quite playable and challenging. The tittle screen is because i have delete it some sprites not ready for the demo, so appears those red blocks. About the enemies... i did the second level with rush because only completed correctly the first level, the second is a recent made to include for the demo in this competition and play with the car and against shadow the hedgehog. If i can i will do a patch fixsing those errors in the second level and intro. Yeah the game holds promise for sure :) Good luck with it. -Fixed some bugs with the enemies in the second level. Really promising! Some playability issues, but it blends quite nicely both Alex and Sonic worlds! Hi Kusfo, what issues? Tell me to improve it. For instance, in the first pit, once you travel to the past if you fall down there and the scroll has advanced a lot, it becomes impossible to climb the stones to pass the pit. The same "almost" happened with one of the following pits, but I was able to overcome the scroll barrier. 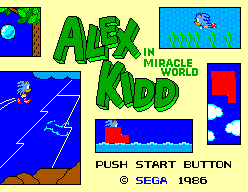 They're not really big issues, and actually, the original Alex Kidd was neither a generous game in this kind of situations. Another awesome hack! But like "Bubble Dragon in Paradise Island" I got stuck again :( Never mind - I had fun playing the game anyway... Interesting use of the Pause button but am I meant to be able to navigate the map? The left and right buttons move sideways here but fire buttons don't do anything so I was a bit confused here. One last thing: I noticed a slight graphics glitch on Game Over screen but very minor of course - just to let you know. Great job!